Located at the corner of Discovery Dr and Los Cameros Rd south of Hollister Ave, Extra Space Storage serves residents of Goleta and Isla Vista. Locals will recognize our facility west of Santa Barbara Airport. Are you a college student who needs summer storage or storage while studying abroad? 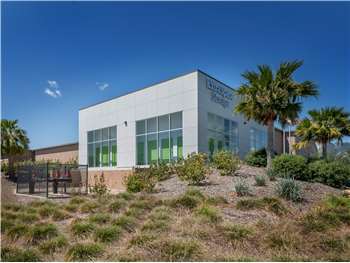 Our Goleta storage facility is about 1.8 miles from the UC Santa Barbara campus, so we're a great option! Extra Space Storage is about 3.1 miles from Santa Barbara Airport, providing convenient self storage close to the airport for area residents and visitors! Extra Space Storage on Discovery Dr offers a variety of storage units, wine storage, climate-controlled storage, drive-up access, and exceptional security. We're the storage solution you can count on in Goleta! Our Goleta storage facility has units ranging in size from 3x3 to 10x10 with convenient features like first-floor access, drive-up access, and more. We have the space to handle your unique storage needs! With advanced security measures like 24-hour video surveillance, individually-alarmed units, security access to your floor only, and electronic gate access, you can store valuable items with confidence. Keep sensitive belongings safe year-round in a climate-controlled unit. Climate control ensures your unit stays between 55 and 80 degrees at all times, preventing damage caused by extreme heat. Save time and energy at our Discovery Dr storage facility with drive-up access. Simply pull a vehicle up to unload and load items without hassle. Some drive-up units can even be used for small vehicle storage. Need to store wine in Goleta? Extra Space Storage on Discovery Dr offers convenient wine storage units in sizes 3x2 to 6x8 that are perfect for keeping your collection safe. These units include features like indoor first-floor access, reduced height, and climate control. With a secure, clean, well-maintained facility and a friendly, professional team, it's easy to see why customers choose Extra Space Storage for their storage needs! We go above and beyond to deliver exceptional customer service and high-quality, reliable self storage. Contact us today to reserve a storage unit in Goleta! Extra Storage is the best facility I have ever used.It is immaculate and well maitained.The staff is even more amazing as they go out of their way to help you and are always available as well as courteous. This is the best storage facility in the area. Goleta Valley storage lost my business. The design of the units makes it super easy to access and grab items needed. Clean too. Friendly staff. Robert is very helpful. I recommend to see this company for your storage needs. Highly recommend if you need a clean and safe storage space. Robert is great and made the process quick and easy. A great place that is super clean, great hours and top notch service! Robert is extremely friendly and makes the process easy. The facility has great hours and is cleaner than my house. My daughter is a college student, and had several weeks between moving out of one place and into the next. Enter ExtraSpace Storage, who was so helpful from start to finish. From location to price, they took all the stress out of a stressful situation. Kudos!! The facility manager does an excellent job. The issue is with the new Extra Storage website. They removed the option to print an online payment receipt. Can Extra Storage enable online payment receipt printing again ? Thank you. Extra Storage Space was super accomodating and friendly. They helped me find a unit that suited my storage needs and the process was quick. I would definitely use them again! First time storage rental. Robert Lopez was quick, stayed late, friendly and helpful. The facility is spotlessly clean. It looks top notch. Drive south on N Los Carneros Rd. Pass Hwy 101 and continue south. Our facility will be on your right after Hollister Ave.
Drive north on S Los Carneros Rd. Our facility will be on your left after Mesa Rd. Drive west on Hollister Ave. Pass Santa Barbara Airport and continue west. Turn left onto N Los Carneros Rd. Our facility will be on your right. Drive east on Hollister Ave. Pass Costco and continue east. Turn right onto N Los Carneros Rd. Our facility will be on your right.